You’re the parent of a high school junior, which means in just two years your child will be on his or her way to college. Although somewhere between getting a drivers license and going on a first date planning for college may have fallen to the wayside. Time is running short and if you haven’t been preparing you have quite a bit of work to do. In this week’s College Savings Timeline, we discuss the five most important college planning steps for the final years of high school. 1. 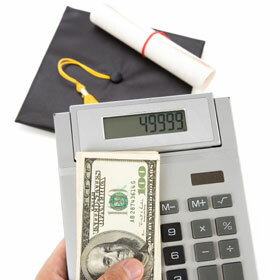 Evaluate your child's college fund (or lack thereof!). If you’ve been saving with a 529 college savings plan, now is the time to compare the balance with the expected costs of the first few years of college. Our simple college calculator can help estimate what your total costs will be and if you will be able to save enough in time. Be sure to double check that your investment allocations are now weighted toward conservative options like bonds. (If you have an age-based 529 plans this is done automatically). If you realize you have saved too much, lucky you! It may still be smart to continue making contributions since your child may end up transferring to another school or continuing on to graduate school. If you haven’t started saving yet, you’ll need to first figure out a way to come up with the required down payment for the first tuition bill. Once you have that covered, you’ll need to start a savings plan to prepare for the remaining semesters. 529 accounts are still a good option, even this late in the game. You will still get the benefit of a professionally managed portfolio and be able to take advantage of federal (and sometimes state) tax benefits. Every little bit you save will shrink your child’s future student loan balance. 2. Narrow down school choices. In order to plan for the upcoming expenses, you need to have an idea of what they will be. At this point, you should have already been researching colleges and touring campuses. While you may have had your heart set on your son attending your alma mater, its important to look out for his best interest first. If you haven’t been able to put away enough money for the school of his dreams you’ll need to explore other options. If you live in a major metropolitan area there may be a number of colleges or universities he could commute to. With average room and board costs around $10,000 it’s almost a no-brainer for cost conscious families. An even less expensive option is to suggest a community college for the first two years. This also gives your child a chance to get their general courses out of the way while they focus on choosing an area of study and the appropriate university to complete their degree. Most students begin thinking about college admissions tests during their junior year of high school. Most colleges will accept ACT or SAT scores, so the first thing your child will need to do is choose which one to take. The ACT is considered an achievement test and is meant to reveal what you’ve learned in school, while the SAT is an aptitude test that measures your reasoning and verbal abilities. There are numerous test preparation courses and materials available, including this helpful list from U.S. News & World Report. Your child should plan on at least three months of studying, but remember that test scores aren’t everything when it comes to college acceptance. Schools look for a winning combination of grades, extracurricular activities and recommendations in addition to test scores when making their decision. The middle of your child’s junior year is the ideal time to start applying for scholarships. If he or she excels academically or is a star athlete, your search should be relatively easy. If not, there’s no need to worry - there are plenty of awards given based on things like artistic talents, race, religion or other unique circumstances. Try not to only focus on the big tickets when applying. Small awards can start to add up and will reduce the amount you have to save or borrow. Application deadlines tend to be in January, but you should continue searching for scholarships each year throughout your entire college career. 5. Learn about financial aid. Juniors have another year to wait before the Free Application for Federal Student Aid (FAFSA) has to be turned in, but it’s definitely not too early to start planning for it. After you’ve narrowed down the list of schools and estimated costs, begin to research state, federal and school aid programs. Your child should meet with his or her school guidance counselor to find out if there are any upcoming financial aid nights. Mark February in your calendar as Financial Aid Awareness Month and be sure to look out for events hosted by high schools and colleges in your area. When it’s time to schedule your campus visits, don’t forget to set meetings with the financial aid office. An in-person meeting will give you and your child the opportunity to have any questions answered regarding policies and deadlines. Don't miss the other great posts in our College Savings Timeline Series!